This newly manufactured ammunition is PERFECT for target practice, range training, or plinking. It is both economical and reliable and is produced by one of the most established ammunition plants in the world. 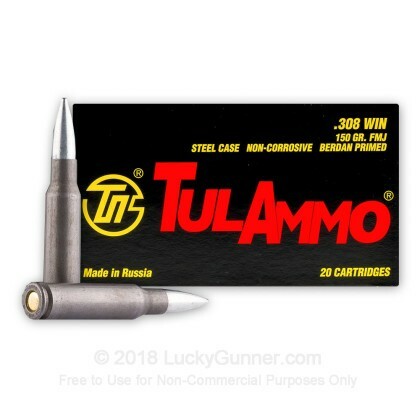 Tula ammunition derives its name from its birthplace, the Tula Cartridge Works in Tula, Russia. The Tula Cartridge Works plant was founded in 1880 and is currently one of the largest ammunition manufacturing plants in the world. The Tula name has gained a following worldwide for its rugged, reliable, and economical product. This cartridge complies with CIP requirements and the casing features a polymer-coated steel casing with a non-corrosive Berdan Primer. The projectile features a bimetal jacket (contains steel and copper) and a lead core resulting in excellent ballistics characteristics. This ammunition is rugged like the country where it was manufactured and keeps its qualities under temperatures ranging from -4 degrees Fahrenheit to 122 degrees Fahrenheit ensuring that it will perform when needed most. Just built a Palmetto AR-10. So far with 3 or 4 hundred rounds through it, like my other guns in varying calibers, It loves Tula and fires flawlessly. I had doubts about buying this but I bought 500 rounds of this cheap stuff and ran about 300 rounds through my C308 and had zero hiccups. Only problem with this ammo is it gets your rifle dirty pretty quick. If you're not using a rifle with a fluted chamber you might have some problems. But for PTR's/CETME's it works pretty flawlessly. The ammo is ment for an 47s and Veprs. The ammo work great in my Ruger American rifle. I had no issues using this ammo semi auto rifles or bolt action rifle. Some usa build guns need to have a more powerful firing pin spring to fire this ammo. I had no fail to fire or issues with cycling. The ammo is good for the price. Great round with my Mossberg. Although my friend had misfires with the same ammo, but every misfire from his gun worked perfectly through the Mossberg. Accurate for 3" group at 120 yards, all 20 rounds. A full 25% don't go off. I've tried them in 2 different rifles with the same result. It's a waste of money and an exercise in frustration. Fed flawlessly in my Vepr 308. Pull 3 boxes from the case randomly, no duds, no FTF or FTE. about 5-6 rounds did seem to have weak velocity being extracted from the rifle, could have had a low charge but cycled none the less and went bang every time. Might cause extraction issues in AR style rifles, and the hard primers might cause issue in striker fired applications (bolt guns etc). Rifles built to handle steel cased with bimetal bullets like a Vepr 308 or Saiga 308, PTR, Galil possibly the SCAR as well shouldn't have any issues at all. Would NOT recommend for personal/home defense or hunting; you'll want to spend the money on a few boxes of Federal or Hornady hunting ammo for that. This stuff? Great for having fun at the range, plinking and getting live rounds under your belt. I don't know why the magazine makes a difference, but any time I put Tulammo in the plastic pmags, my S&W M&P10 has extraction problems (at least once per 20 rounds). This ammo works fine out of the steel magazines, and in my bolt-action Savage. It's reasonably accurate and consistent, and I don't recall ever encountering a dud primer. But since the last failure-to-extract from my AR required anti-seize lubricant and a screw extractor (the back of the case sheared off when trying to tap it out with a rod), I'm not going to be taking chances on it in my AR any more. YMMV, and the money saved by buying steel-cased ammo probably makes up for the increased wear-and-tear of having to manually extract cases once in a while. But I've decided I value peace of mind and my range time more than I value the extra money required for brass-cased ammo. So I've bought my last case of Tulammo 308. My 357 also has extraction problems with steel-cased ammo. But my 9mms are very happy with Tulammo. This stuff also seems a little dirtier than pricier ammo, and requires extra cleaning time. 1st box of 20 and I had 3 duds. Even tried to shoot them a second time in another rifle with no success. Now I have 480 more rounds to go through. Definitely don't want to use these where your life may depend on it. LG is the best online ammo retailer. Period. Russian ammo? Meh. And they ship to ny Lg is tops. So far ran about75 rounds through my new 308 build. I used a ALG Combat Ready trigger with 4.5 lb pull and have had three misfires. The rounds fired when I tried them again. Not sure if the Berden primers are the issue or if I need to put a heavier spring on the hammer. No feeding issues encountered so far. Will be purchasing some PMC to see if it is any different. I've only used this ammo in my Cetme rifle, it has never let me down. As far as price can't be beat. As far as accuracy it does me just great. Have my scope and red dot scope sighted in with this ammo. I stock up with this ammo for range time and for anything else. the money I save from not buying brass case ammo has allowed me to buy more of this steel case ammo. 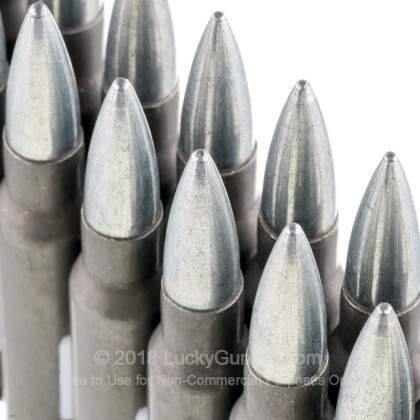 This ammo will take down large or small game animals or, "zombies"
Do away with steel casings. Good ammo for the price. I've only shot 40 rounds so far out of the 500 but haven't had a single problem yet. Shooting out of a dpms 7.62 51 ar platform. Just fine for target shooting! Over the years I've shot probably more that 3000 rounds of various calibers of this brand and had only one bad round. I bought 500rds and didn't want to judge till after I've shot about 300. I've only shot this through my Remington 700 between 100-400yds. Only out of a bolt gun. Can't speak for anyone using AR platforms. Cannot recall any misfires but the one problem I did get was the cases expanding. This happened few and far between shot groups and was easily remedied by sliding a cleaning rod down the barrel (with little effort) and tapping them out. Cant get less than an inch group at 100yds but it'll still hit an 8 inch steel plate at 400. I recently purchased 500 rounds of the same condition and within the first 30 rounds had ,10 fte from my savage throphy Hunter. He careful as this gun does not like this ammo. The last round in the magazine didn't feed properly and jammed the bolt. All other rounds worked flawlessly and shot cleanly and accurately. But the last round jammed, twice. The first one was easy to extract, but the second one required prying. That's not something I want to do to my expensive rifle, especially with a live round in it! I was using 20-round pmags with my M&P10. I've put several hundred rounds of other .308 ammo through the rifle (all brass-cased, mostly PMC from LG and lots of commercial reloads) and never had any problems. I'll have to try the Tulammo in the factory 10-round mag and the 20-round steel mags I've got. Maybe I'll just have to load my mags with 1 brass-cased + 19 Tulammo. That would be annoying. 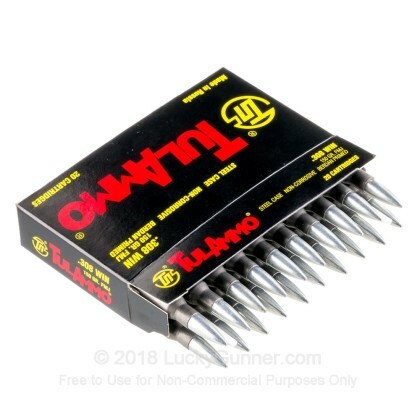 I've been buyingTula ammo for a long tim. It works great in my Century International Arms AK 47. It's all I ever buy for my SAIGA 308. I've never had a jam or a misfire in either one. It's great ammo for the range . I use it for the range and stock up on the good brass stuff to use when the time ariseslike war on our home ground or zombies or the Apocolypse. Hey, one never knows, does one???. Anyway, I highly recommend it. I bought 500 rounds of steel ammo at a very cheap price and thought "I'm going to get what I paid for". I shot around 50 - 90 rounds and every shot was not only good, but accurate at 200 yards. A gun friend of mine asked me where he could buy that same ammo - and yes I told him. I bought about a dozen different types/brands to test with my new Browning BAR Hogstalker. 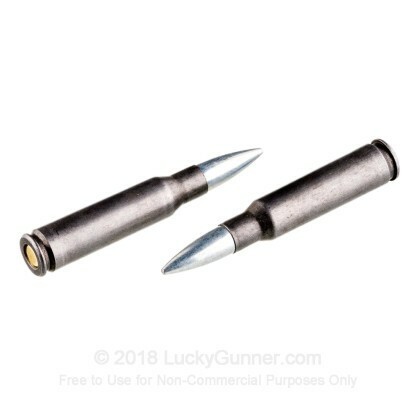 Everything fires perfectly through it except these TULA rounds. Roughly 1 in 3 fail to fire. One can argue that my rifle is the problem, but every non-Russian brand I have tried works perfectly (PMC, Privi Partizan, numerous types of Remington and Federal in target, match, and hunting varieties). I have had similar issues with TULA in 9mm. It fires perfectly out of two Barrettas (92a1 and cx4) I have but fails to fire frequently from a Kahr PM9. But the Kahr fires everything else I've ever tried without any failures at all. I guess the TULA primers need to be struck harder than other ammo and some guns just don't strike quite hard enough. Also, the TULA seems to leave a gun dirtier than just about any other brand of ammo I've shot. This is consistent across all calibers I've tried. Lucky Gunner is great, by the way. I have ordered from them many times and highly recommend them. Great service and fast shipping. Runs really well through my DPMSGIISASS, come to think about it, everything does that I have purchased from Lucky :). 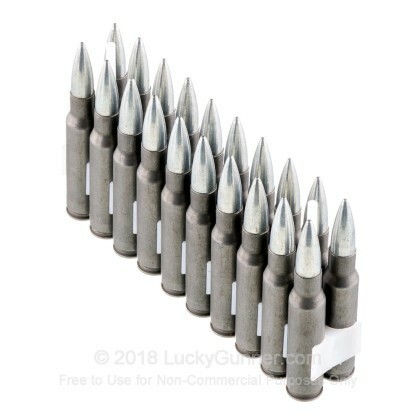 Ordered 160 rounds of this ammo for my CETME. Have not been to the range as of yet to shoot it. Have heard and read good things about using this ammo in the CETME. Will report back when I do, this is a good price for this ammo and fast service from LG. I shoot alot of .308 and this ammo gives me a 4 in group at 375 yards. Couldnt ask for better without going to the high dollar ammo. does the job/ but runs a little dirty. overall happy with the product. Bought this because my 1919a4 now has a crank fire on it so it is as close to full auto that you can get without the paperwork. So i need alot of 308 to run trough it so why not the tula and i also use the wolf. Great stuff fits my need perfectly. Can't say that i tried this lot that i just purchased but have used this in the past w/ my G3 and its very accurate and consistent ammo. Have found a couple that didn't have the primer sealer around the primers. A: Hi Mateo, These rounds are steel cased with a lead core and bi-metal jacket. They will attract a magnet. I'm sorry to have to advise that they will not pass a magnet test. Q: Dear lucky gunner I have started shooting Tula 308 150 grain in a DPMS LR308 Gen 1 Ar10. I have noticed that it smokes what I think is a excessive amount when I shoot this in comparison to brass 308 or wolf 308. It seems to extract the case fine when shot but the excessive amount of smoke I have never seen in other brass or steel cased 308/762x51 rounds. Is that normal and is that any type of safety issue I should be concerned with? It seems like it extracts fine but just a little concerned over the amount of smoke it produces. Thank you for your insight on this topic. A: Tula uses a unique gunpowder blend, and as a result, could be the cause of the smoke. This has not been confirmed by the Tula manufacture. Issues that might arise would be a dirtier gun after range time. Therefore, proper cleaning should be undertaken to ensure future use will not cause issues with ejecting, loading, and cycling of the action. 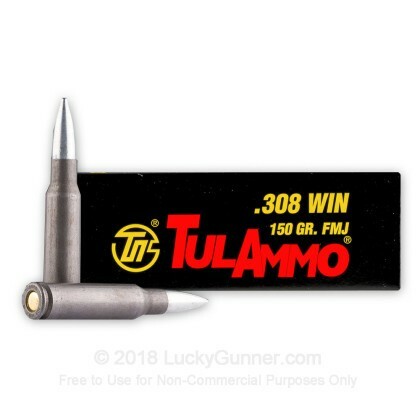 We also have this 308 - 150 Grain FMJ - Tula - 20 Rounds ammo in stock in a smaller quantity.